If you've read my previous post about Polly Pocket toys, you'll remember that my daughter was absolutely fascinated after being introduced to the world of Polly. The toys I reviewed then were all larger and included suction cups on the bottom, which were just perfect for my 3-year-old to manipulate. This time, the Polly Pocket toys we received were more like the original variety and included small pieces without suction cups. We also received a DVD containing a short video of one of Polly's adventures, entitled "Friends Finish First". I reviewed the Polly Pocket Playtime Pet Shop Playset from Mattel which retails for $32.99, but is currently on sale for $32.48 with FREE SHIPPING. Polly Pocket is a quality brand that has been around for quite some time. 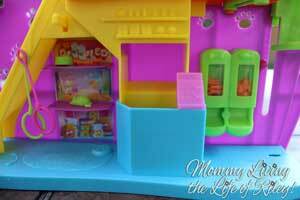 I can even remember having a Polly Pocket playset back when I was a little girl. The only thing though is that the original Polly Pocket sets were made to travel around literally, in your pocket (or purse at the very least). 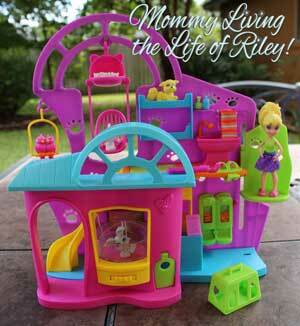 Today's Polly Pocket toys include larger playsets with the characteristic of being able to be linked together. This way, you can build an entire town for Polly Pocket! 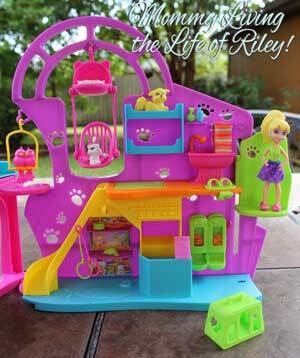 Mattel's latest Polly Pocket creation is the Playtime Pet Shop Playset. This gem of a toy has so many unique and interactive features that your little girl is sure to love! For instance, the storefront contains a carousel for parading pets around in the front window as well as a human and pet entrance. Inside the pet shop, there's just so much going on! As you can see from the picture above, the pet shop includes kitties, dogs, rabbits, birds and a mouse. There's a pet carrier, two treat dispensers, two leashes and a bathing station complete with towel and shampoo. A double pet swing and a bird perch are available in the pet shop as well as a slide, a cash register, an elevator and a trap door so that the pets can quickly come down to the first floor. With all of these accessories and fun extras, imaginative play abounds! 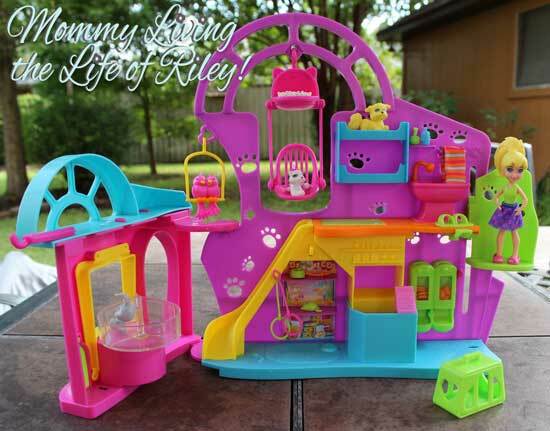 My daughter couldn't get enough of playing with the Polly Pocket Playtime Pet Shop Playset, but I must admit that because the parts were smaller and lacked suction cups, she seemed to get frustrated more often than with the previous playset we reviewed. Polly was difficult to stand up and the shampoo bottles were always falling over. Although this playset is great fun and I recommend it highly, it might prove to be less exhausting for an older child with better fine motor skills. The Polly Pocket DVD we were sent to review was entitled "Friends Finish First" and was approximately 25 minutes long. Honestly, neither Riley or myself cared for this video very much for the characters seemed rather shallow and girly and were always busy applying lipstick. Personally, I like Riley's female role models to have a bit more substance and not be focused so much on physical appearance. The story line didn't really hold Riley's attention for very long either and she was quickly asking me if we could watch something else. 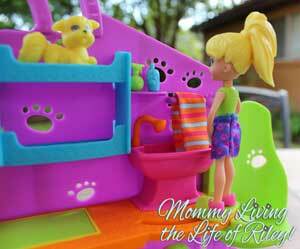 Irregardless of our views on the Polly Pocket video, the Polly Pocket toys are all top-notch! It's really neat to see my daughter enjoying the same brand of toys that I loved so much as a little girl. If you'd like a surefire way to develop your child's imaginative and creative play skills, then be sure to introduce them to the world of Polly! 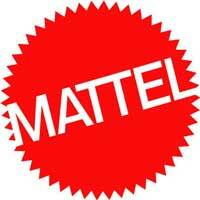 Disclosure: I participated in a campaign on behalf of Mom Central Consulting for Mattel Polly Pocket. I received product samples and a promotional item as a thank you for participating.